FARA, IITA with other key stakeholders of the West Africa Action Area of the Humidtropics program co-organized a two day training between 22nd – 24th of June 2015, and the launch of the first Humidtropics Innovation platform in Cote d’Ivoire. The program drew more than 90 stakeholders of the agricultural research and development in the Nawa area and was held at the ICRAF station conference hall in Soubre. The five module training was led by Dr. Wole Fatunbi the Ag: Divisional Manager for Visioning Agricultural Transformation in FARA assisted by Dr. Latifou Idrissou, of IITA (Coordinator, Humidtropics Program in West Africa), and Mr. Claude Adjehi (Communication Officer, ICRAF, Abidjan). The training which was opened by the Governor of the Soubre Prefecture Mr. Alkali Kouadio, expressed the excitement of his people about the initiative and the need to foster more agro-baesed development initiatives in Soubre prefecture. The training module emphasized the need and the pathway to derive maximum benefits from agricultural research interventions by creation of an innovation platform. 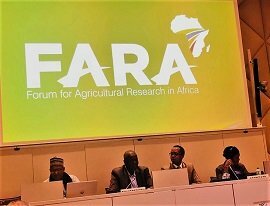 Dr. Wole Fatunbi, explained the theoretical frame of the innovation systems approach, its use in agriculture as developed by FARA in its IAR4D framework and the testing for a proof of concept within the Sub-Saharan Africa Challenge Program (SSA CP). He further presented the roadmap to establish and manage a successful innovation platform. Front: from right to left Dr. Wole Fatunbi (FARA), Dr. Idrissou Latifou (IITA), Deputy Mayor Dago Tegbeu Nestor, Dr. Jacob Nandjui, and Mr. Fidele Kouadio from GIZ/PROFIAB in a photo session with other stakeholders. The training was followed by the launch of the Soubre Innovation Platform at the Soubre City Hall and was attended by the Governors of Meagui, Gueyo, Buyo and Khorogo prefectures. The first full interaction of the innovation platform also took place to identify the commodities of interest, map the constraint and come up with initial activities towards the generation and use of interventions. The Soubre IP will be working within the Cocoa based farming system of the Humidtropics and will use rice as the entry point commodity into the system, this will ensure rapid benefit in the short run from the different interaction of stakeholders on the platform. The first sets of priority problems around the rice commodity is the supply of needed inputs viz, improved seeds, fertilizer and agrochemicals, followed by streamlining of the output market for profit. The configuration of the Innovation platform with the right set of stakeholders including the rice end user and input dealer will facilitate this and will hopefully result in the first level of measurable outcome and impact. The platform will be facilitated by Dr. Jacob Nandjui of the Département de Formation et de Recherche Agriculture et Ressources Animales (DFR-ARA).